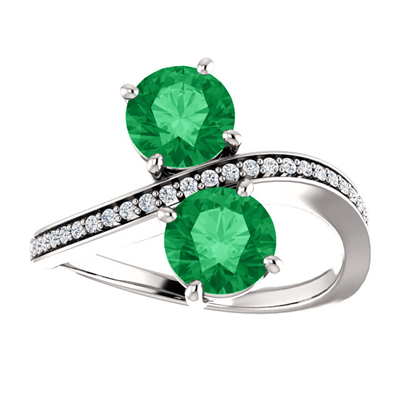 An elegant pair of fine emerald gemstones set in 14 carat white gold make this "Only Us" ring eye catching. Measuring 6mm and a total carat weight of 0.13, is handcrafted to create a fine piece of jewelry you will cherish for a lifetime. We guarantee our "Only Us" Emerald and Diamond Two Stone Ring in 14K White Gold to be high quality, authentic jewelry, as described above.